I met the Quay brothers at the restaurant of the Folkwang Museum in Essen - a small museum in the Ruhr area, where one can admire the works of Max Ernst, Arnold Böcklin, Wassily Kandinsky, and as well as other eternal names of the art world: Cezanne, Picasso, Renoir. 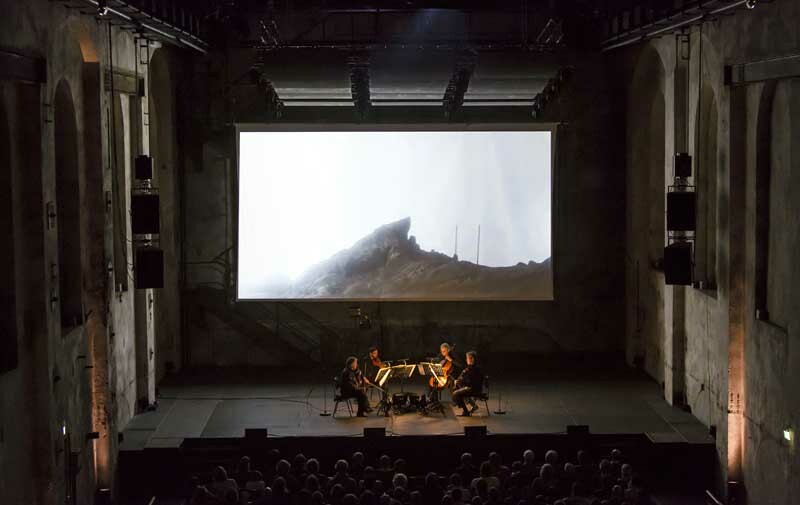 Our conversation took place a few hours before the premiere of their new KwartetSmyczkovy, based on the music of Lutosławski and the drama by Peter Handke, in the postindustrial spaces of the Ruhrtriannale, which have been adaptated to concert halls, theatres and cinemas. 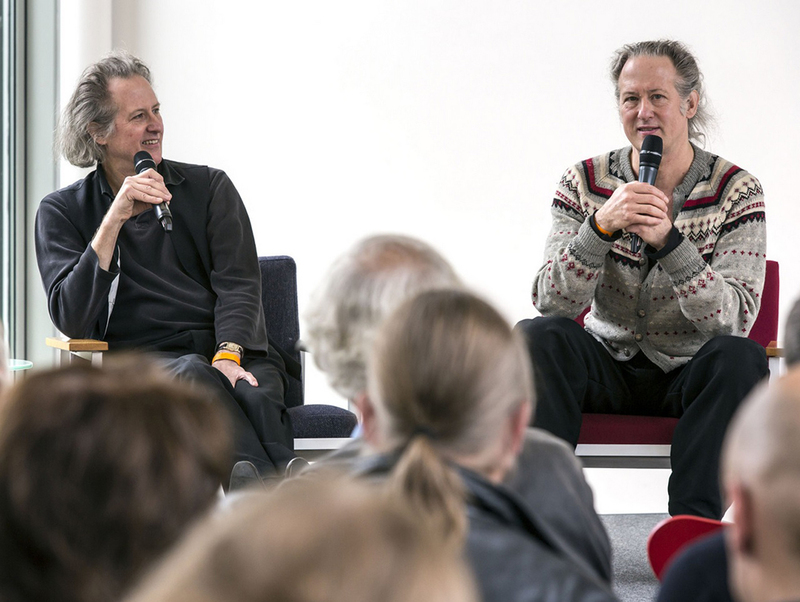 The Quay brothers, photo: Ruhrtriennale. Meeting the Quay brothers is undoubtedly challenging: the American-European twins are cinema legends, and are notoriously disinclined to give public speeches and interviews, or to participate in large-scale events. To who manage to obtain an interview, they speak in one voice - sometimes Stephen says a few sentences then Timothy seamlessly takes over. Sometimes one brother asks another to find the right word or to express his opinion (also the former's opinion but the latter can perhaps better formulate it). No wonder their artistic visions are so coherent. Surrounded by century-old masterpieces and with a bottle of white wine, we began conversing. Filip Lech (Culture.pl): You call the music in your films a ''secret scenario''. I'm interested in how the Quay Brothers like to listen to music? Quay Brothers: Every day we arrive at the studio at 5 in the morning. And we're listening to music all the time: from the radio or TV. In the case of Witold Lutosławski, we had received collected works by him, everything was on CD. So every morning, when we're doing our homework, we have to listen to a piece every day, we played it again, played it again next day... Then we say: ''no, not that one'' [laugh]. Because, there's certain music we feel won't accept images. We think that music complements images – that's the idea instead. In this case the String Quartet promised a lot for images... the String Quartet had enough space for the images. That's very important, otherwise the image is sort of next to the music, it's too much. Like when you're tired after jogging. I'm asking about your ways of listening to music, because after the invention of phonograph by Thomas Edison, the perception of music changed. Today, we will see your new movie which will be accompanied by the Arditti String Quartet. There's that famous quote by Eric Dolphy from his last recording session: ''When you hear music, after it's over, it's gone, in the air. You can never capture it again''. Do you think that our reception of KwartetSmyczkovy would be very different from that of viewers who will see your film as usual, in a cinema? We're here once, that's only one performance. After that, it will disappear, it will evaporate in your ear. So, the people tonight can go home, and listen to Lutosławski on CD, but the images are going to vanish. Space is a term which is very important to this kind of music. Listening to Lutosławski with headphones is something very different from listening to Lutosławski in the philharmonic. Yes, that's like the difference between the public and the private. When you're going from earphones to theatrical space, it is something different, but no less interesting. It's just circumstances. You're listening to Lutosławski in your headphones when you're writing: then you close your eyes and you're totally absorbed by the vacuum of music, which is the ideal space. But I can open my eyes, and see that waiter coming with hands full of things, and when I'm listening to Lutosławski then, it is already a soundtrack, even an absurd one. Your cinema seems to me very non-anthropocentric: it focuses more on objects. On the other hand, Lutosławski's music is very humanist. Critics who write about his music tend to mention his private life, as well as the historical and political context. We read as much material as we could about Lutosławski and his String Quartet, and we were trying to look for some problematic background to it. The String Quartet was commissioned by the Swedish Radio. It seems to us that he didn't approach it with any mission or a programme. The String Quartet was a provocation, and he accepted it. He actually thought about it for a long time, we think that he didn't like string quartets in general. It's like any of his other pieces, really remarkable, quite unique. It doesn't have that more ''humanistic'' moments that we can find in his orchestral pieces – it's very abstract. I wanted to ask you about silence in your films. Do you like silence? We should put more silence into our films. We love music so much that we want to cover the whole film with music, and forget about silence. I mean, we're very well in the universe of sounds, but silence is part of sound. I think that it's something that we want to discover more – a radical silence. But you always need a commission, and our commissions are usually music commissions, so they aren't as much interested in silence. Yes, exactly [laugh]. It's like intentionally making the screen black. You can do that, but this brings the question: Why did you choose to make the screen go black? Maybe just to hear this sound, that fragment of music, while people will say: ''Oh, the projector broke down'', and they won't listen to that music or silence. If somebody asked us to do a film which is completely silent... That would be a horror, that would be hell for us! When you're working in the world of literature, you're in the world of ideas, and music is a physical phenomenon – every sound has its own physical characteristics. As does animation, which is not only art, but also science, or maybe even alchemy. Do you think that everything is connected – issues of emotion, and the motions of cinema with the emotions and physics of music? We're looking for secret alloys between what music can offer in the combination of objects. Music tends to reveal something about alchemy, what otherwise would not be there. For us, music anticipates silence, or that little trembling that light also gives. We try to find equipment. There are very short sets, no objects instead, there's no lifelessness. Everything has life it in, even when it comes to making the montage, when we slice an image this way or that way to a musical note, it makes a difference. And there's one way which is right for us, even if we haven't anticipated that. This is the power of music. We lay the music on top of the scenario, which must adjust... it has to adapt to musical laws rather than dramaturgical. Sometimes music is like whispering: very suggestive. Like the undertow underneath circuits of the water, very strong, that's pressure – maybe psychological or whatever – but it's truly powerful. You're music lovers, but also cinema lovers. Do you have a favourite use to music, favorite sounds in movies by other film makers? One of the greatest sound films was Borowczyk's Les jeux des anges with music of Bernard Parmegiani. It's so graphic, because the image is so stylized, very painterly. You can have that feeling of dislocation. I think that animation has the advantage, because that's a purely imagined world, it's more transportive. Normally in a live-action film, when you put the glass on the table, you hear the knock of the glass. In Hollywood cinema, if something is wrong with the sound, the audience gets upset, because it all should be real. I find in your cinema that which Freud called unheimlich – the uncanny, the strange. Do you have some kind of favourite music which has a climate similar to your films? Back in the '70s we recorded a lot of radio. At that time we've done experiments with slowing it down, and finding... you know, some type of static. It was provocative and wonderful, because you were just removing music from its original context and giving it an alternative life which could be intriguing. We also hear a lot of film composers about whom we say: “that's amazing, we can learn a lot from that”. For example Penderecki: the aleatoric expression is still remarkable, like a state of mind. That is the kind of music in the film which can really take the film on a different level. And not on that level on which certain Hollywood directors like Kubrick and Friedkin use their music – they just play it very loud and don't get profoundness off their music. Speaking of Krzysztof Penderecki, you have to discover a young Polish pianist Piotr Orzechowski – Pianohooligan: he plays orchestral pieces by the young Penderecki on prepared piano, it's absolutely amazing. Your connections with Polish culture are extensive: from Bruno Schulz to Stanisław Lem. You've worked with music of Leszek Janowski, Krzysztof Penderecki, and now Lutosławski. Do you like any other Polish music? We won't say Chopin [laugh]. Krzysztof Komeda – we love his music. There's Wojciech Kilar, Górecki, Szymanowski. We also adore Konieczny, Ewa Demarczyk.